Leap's mission is to provide top quality arts education programs that help students build skills to achieve their fullest potential. We envision a world where art is a fundamental part of every child's education and success. Leap Arts in Education is a private nonprofit organization founded in 1979 in response to the severe cuts in California school budgets that effectively eliminated the arts from elementary education. Led by Founder Daniel J. Sullivan and Founding Director Trudy Zimmerman, Leap served 180 children in one school in its first year with hands-on art experiences. Encouraged by the positive changes witnessed in the pilot program and by the overwhelming response from the community, Leap expanded its programs and increasingly served more schools each year. Additional teaching artists joined the Leap roster to provide innovative arts instruction in their specific area of expertise, covering a wide range of artistic disciplines including painting, sculpture, murals, storytelling, theater, multi-media, music, and dance. In 1985, Leap initiated its architecture residency program in collaboration with the American Institute of Architects, the first ever in the Bay Area. In 1987, Leap was the first arts education organization to receive the San Francisco Chamber of Commerce Business/Arts Award for Excellence, in recognition of the impact its programs have had on a generation of San Francisco children. 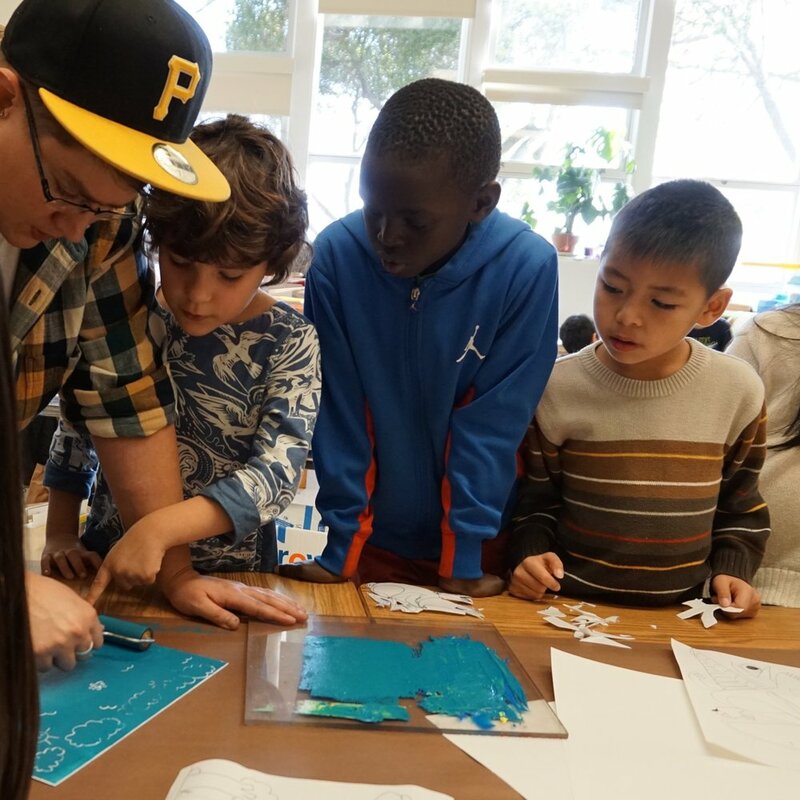 Today Leap’s art and architecture residency programs serve 7,000 Bay Area children each year, offering students the opportunity to engage in visual and performing art and architectural learning experiences that enhance their overall education, and prepare them for future success in school, in their communities and in life. Residency projects are designed with classroom curriculum, students, families and community in mind, and as such, focus on enhancing cultural awareness, individual empowerment and equity within and across local communities while promoting a broader sense of self and environment for each student. Performances, culminating events, and visual arts projects executed by the artists/architects and students bring communities together to recognize their children as individuals with special talents and newly increased levels of self-confidence, thus encouraging family involvement in all aspects of students’ lives. Education without art is INCOMPLETE. We work with the best professional teaching artists to create student focused life changing experiences for children. Every school Leap touches becomes a better institution because our work enhances curriculum and helps develop better students. We work to achieve exponential impact. Our programs help create social equity by allowing children to Leap beyond their challenges and what they thought possible.